The heroic Captain Planet spent most of the 90's flying about the world and using his superpowers in an attempt to bring the level of pollution down to "zero". He is summoned when the five brave Planeteers use their power rings of fire, water, earth, air and heart. Many people enjoy mocking the power of heart, and the poor Planeteer Ma-Ti who was stuck with this useless power. While his fellow Planeteers could shoot fireballs or wreck havoc with wind, Ma-Ti used his ring to make people feel slightly better about themselves and others. His critics are fools though, as heart was the most important power of all! It is important to note that four of the Planeteers' rings are the classical elements - Earth, Fire, Air and Water. Heart is not an element, it is a clear interloper in this. Rather than being naturally based, 'heart' is something far more human. Less physical, more emotional. So what is going on? 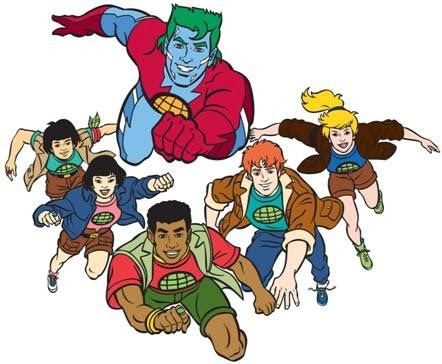 Captain Planet was created by Mother Nature to "bring pollution down to zero". Rather than being able to recycle materials and absorb waste, he instead has super strength and the ability to shoot lightning. This does not make sense until you realise that the main cause of pollution is humanity. To truly destroy all pollution, Captain Planet must destroy humanity. He is the creation of Gaia and so unfettered by love of humanity. His mission is the survival of the planet, not humanity. Captain Planet's insane powers are useful only if he was designed to either kill all humans or destroy enough infrastructure to return mankind to the stone age. This is where 'heart' comes in. Heart is not an element like the other power rings, it is something external to this, something unique to mankind. The power of compassion changes Captain Planet's nature from a being who wants us all dead, to one bound to humanity and its concerns. It would be simple for Captain Planet to annihilate us all if summoned with the original four rings. Thank goodness for Heart.